Curated by Carly: Happy St. Patrick's Day! Hope y'all are wearing green today! 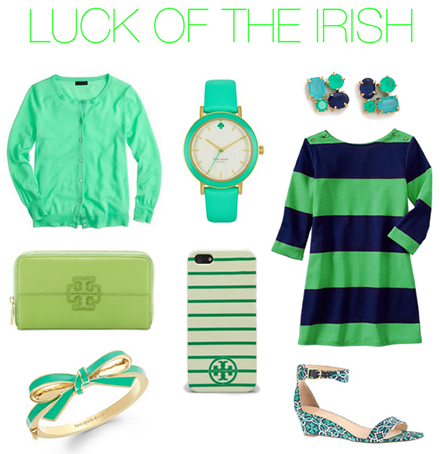 Here are a few of my favorite items that embody the spirit of the Irish! I'm wearing my favorite mint striped oxford shirt today! Hope everyone has a wonderfully lucky day (and be safe to those who will be celebrating tonight)! I'll be taking exams all day and study for more tonight. Celebrate for me! I love all of these touches of green - such pretty shades! I will be working tonight, so I'm right there with you. I'll be jealous of all of those out celebrating! I LOVE your picks! I can't pick a favorite piece. Hope you've enjoyed St. Patty's! I have next to nothing green in my wardrobe, and it's such a versatile colour! Great picks!